Professor Christopher Collins, Professor Michael Depledge, Dr Gary Hutchison and Dr Peter Matthiessen appointed to HSAC until 31 December 2015. 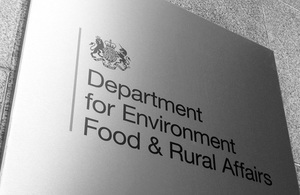 Lord De Mauley, with the agreement of the Devolved Administrations, has appopinted four new members to the Hazardous Substances Advisory Committee. Professor Christopher Collins, Professor Michael Depledge, Dr Gary Hutchison and Dr Peter Matthiessen are the four new members appointed for three year terms from 1 January 2013 to 31 December 2015. Professor of Environmental Chemistry at Reading University specialising in the fate and behaviour of pollutants in the environment, and the assessment of risks to human health and ecosystems with twenty years of academic research experience and sixty refereed papers published. Professor Collins’ work is used by industry, regulators and the academic community to develop and validate chemical exposure models. Since 2009 he has been a member of Defra’s Veterinary Products Committee (as the Food Standards Agency nominee). He is a former UK President of the Society of Toxicology and Chemistry. He currently sits on the Editorial Board of two key scientific journals (‘Environmental Toxicology and Chemistry’ and ‘Soils and Sediment Contamination’). Professor Collins was the soil science expert on Radio 4’s Home Planet until it ceased broadcasting last year. A recognised leading expert on the effects of chemicals and radiations on biota and humans, both in leading universities and research institutes, with several hundred publications in peer reviewed scientific literature. First Chair of Ecotoxicology in Europe in 1987 (at Odense University, Denmark), and subsequently Chief Scientific Advisor for the Environment Agency of England and Wales. Advisor to the World Health Organisation on endocrine disruptors and current chair of the WHO’s working group on nanomaterials. Formerly an advisor to the United Nations Environment Programme, the Intergovernmental Oceanic Commission, and the International Maritime Organisation on marine pollution issues. He was a founding board member for Natural England and served as a member of the Royal Commission on Environmental Pollution contributing to several reports, including one addressing nanomaterials. Current Chairman of the Scientific Advisory Group on Environment for DG-Research and Innovation in the European Commission. Currently Director of the Centre for Nano Safety, and Reader in Toxicology at Edinburgh Napier University. Expert in particle and reproductive toxicology. His research background stems from the Medical Research Council Human Reproductive Sciences Unit, as well as experience of large collaborative nanotoxicology projects. Dr Hutchison is an active member of the UK and international nanotoxicology community and is a reviewer for grant awarding bodies and key journals in this field. A leading expert on aquatic pollution issues with over 130 peer-reviewed papers and major reports published on aquatic ecotoxicology. As well as having led environmental research and monitoring programmes for over 40 years, has maintained a particular focus since the mid-1980s on endocrine disrupting chemicals. Has been closely involved in chemical risk assessment and regulation and most recently, served as a member of the Advisory Committee on Pesticides, for five years to November 2012. He is also Co-chair of the OECD Validation Management Group for Ecotoxicity Tests, and as such has extensive knowledge of ecotoxicological test method development and use. Currently self-employed as a consultant ecotoxicologist, but has previously held senior research positions in the Centre for Ecology and Hydrology, and the Centre for Environment, Fisheries and Aquaculture Science. Member of the recently formed European Food Safety Authority (EFSA) Working Group on endocrine disrupters. The appointments were made through a process of open competition in compliance with the principles of the (1 April 2012) Code of Practice for Ministerial Appointments to Public Bodies. After seven years in post Dr Peter Donnelly, Dr Qintao Liu and Mrs Hilary Stone will be standing down from the committee at the end of their second term of office. They each made valued contributions during their tenures and ministers are grateful to them.